When a government contractor sells the government a product that does not work, they are usually subject to large penalties. When this product is one that is used by members of the military as military hearing protection, it can subject the company to additional liability. This liability manifests itself through the form of military hearing protection product liability lawsuits. 3M has recently settled a 3M Earplug lawsuit filed by the government that it made false claims in supplying the military with these military hearing protection combat earplugs. This claim was originally filed by a whistleblower on behalf of the U.S. Government. Now that the military earplug lawsuit settlement has been entered into, the first 3m combatarms earplug lawsuits have been filed by former service members against the company for injuries suffered through use of a defective product. What are 3M Combat Earplugs? 3M’s combat earplugs were intended to prevent loud noises from entering soldiers’ ears and causing damage. Combat often subjects military forces to noises that are literally deafening. If the combat ear plugs do not work, soldiers can suffer permanent and debilitating hearing loss or tinnitus. The latter condition is when there is actual ringing in the ears or the sensation of ringing. The combat earplugs that were supplied by 3M were dual ended earplugs. Either end of them can be inserted in the ear. There was a different type of protection depending on which end was inserted into the ear. These were supplied to all troops in combat from 2003 to 2015. This spanned wars in both Iraq and Afghanistan. The earplugs were initially made by Aearo Technologies, but 3M bought the company in 2008. Aearo and then 3M were the exclusive provider of earplugs to the U.S. military. What are the criteria to be in the 3M Earplug Lawsuit? The issue with these earplugs is that they loosen in the ear. This not only reduces the level of protection, but it leaves the ear vulnerable to the loud noise that the earplugsare intended to block. In other words, when the earplugs move out of place they simply do not work. This occurs because one end of the earplug presses against the wearer’s ear canal and folds back to its original shape. The earplug only works when it can mold itself to the ear, and when it returns to its original shape after being inserted into the ear, it is malfunctioning. This is because it does not maintain the seal that it is supposed to give to protect against noise. 3M was sued by a whistleblower related to the ear plug case on behalf of the United States Government. One of the remedies that can be applied when a company sells defective products to the federal government is a suit under something known as the False Claims Act. This statute is intended to punish those that defraud the government in any way. The real meat of the statute comes from the potential penalties. The government can recover up to three times the damages that it suffered. That punishment is intended to act as a deterrent to those that would attempt to defraud the government. Anyone can bring suit on behalf of the government in an action that is called a qui tam. The whistleblower, who is referred to as the relator, can receive a portion of the money that the government recovers. Here, the ear plug case, otherwise known as the “3M lawsuit” claimed that the defects in these plugs were known to the manufacturer as far back as 2000, and were not disclosed. 3M was accused of certifying that these earplugs met the relevant testing standard when, in fact, they did not. 3M settled the False Claims Act lawsuit in July 2018. As part of the settlement, 3M paid the government $9.1 million to resolve the False Claims Act allegations. The company did not admit guilt as part of the settlement.This False claims act settlement is the beginning of the problems for 3M as hearing loss settlement amounts will need to be paid to tens of thousand of victims. Recently, veterans have begun to file lawsuits against 3M related to the combat ear plugs, claiming that they suffered permanent hearing loss as a result of the defective earplugs. Notwithstanding any settlement with the federal government, veterans and military personnel can still file suit against 3M. In fact, injured servicemembers have to sue 3M as a result of the army ear plugs if they want compensation because the Feres Doctrine prevents them from filing suit against the United States. These army ear plugs lawsuits have proceeded under the product liability theory, alleging that the earplugs were defective. If the plaintiffs can show that these earplugs were defective and caused their injury, then they can recover from 3M. The company had a duty to warn of the defects of their product and failed to do so. At least 11 combatarms ear plug lawsuits were filed in January 2019. Several of the ear plug lawsuits have been filed in Minnesota, where 3M is based. The soldiers who filed these combatarms suits have alleged that they have suffered some degree of permanent hearing loss from the use of these earplugs. It is anticipated that these lawsuits are simply just the beginning of what will be a torrent of legal action that the company will be facing. Given the sheer number of soldiers who were sent into combat and were required to use these earplugs, it is anticipated that 3M could eventually be facing thousands of lawsuits by veterans. It is also expected that these military hearing protection lawsuits will end up as multi-district litigation. This is not the same as a class action suits. Multi-district litigation merely consolidates cases together for purposes of discovery, settlement and pretrial issues as opposed to litigating the merits of all of the cases at one time. With multi-district litigation, there are several bellwether trials to determine the merits of the lawsuit and possibly the proper settlement value. Other military earplug lawsuit attorneys have indicated an intent to file a class-action lawsuit. 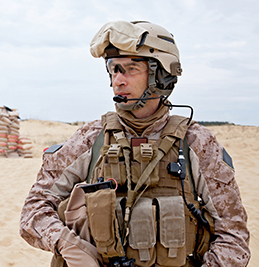 If you served in combat overseas after 2003 used military ear protection and have suffered any form of hearing loss or have any problems hearing, you should immediately contact a ear plug case lawyer to discuss your case. When you speak with the 3M earplug lawsuit lawyer, you can relay the facts of your case, and the lawyer can inform you of your legal options and the process whereby you can possibly recover for the damages that you have suffered. The consultation is free and the 3m earplug lawsuit awyer is usually not paid unless you receive some sort of combatarms financial compensation as a result of your military earplug lawsuit.